Show off your ghoulish creation with these simple photography tricks. Editor's note: This digital photo how-to, first published in 2009, is one of our Halloween favorites. If you're mixing it up with pumpkins and cameras, check out these photographic tricks and treats. For photographers, Halloween can be an especially scary time. With nightfall comes a host of photo horrors, including blurry images, unsightly noise, and mis-metered scenes. In fact, you’re likely to run into all of these ghoulish troubles when photographing your carefully-crafted jack-o-lantern. 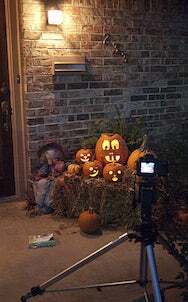 Here are some tips to help you get good shots of your pumpkin handiwork. To show off your candle-lit carving, you’ll want to shoot your pumpkin at night. This means you’ll have to deal with a few extra complications. Before you even pick up your camera, find the right spot for your photo shoot. In keeping with the spirit of the day, that’s going to mean scoping out some creepy lighting. If you’ve ever placed a flashlight under your face to frighten small children around the campfire, you know the drama that a single light source can produce. When positioned effectively, a single light casts dramatic shadows across a bumpy surface and emphasizes texture. This means that your porch light should do the trick. To add some shadows to our scene, we built our subject up away from the porch light. Whatever you do, avoid placing your pumpkin directly beneath the light: when light shines straight down along the grooves in the pumpkins, it won’t create many shadows (unless you have an especially odd-shaped pumpkin). Instead, try placing the pumpkin a few feet away from your porch light to create strong side lighting—rotating it until you find the spookiest shadows. Be sure to do this with a lit candle inside the pumpkin so that you can see how your light source combines with the pumpkin’s internal light. Although it may seem counterintuitive, you’ll get the best results if you don’t wait till complete darkness for your photo shoot. Instead, aim for about twenty minutes after sunset. The fading light will provide a nice fill light for your scene and ensure that you can see the edges of your pumpkin as well as the glowing design. Since you’re shooting in low light, you’re most likely going to have to use a slow shutter speed. This means you’ll need something steady to rest the camera on. I recommend a tripod, but any stable object should do so long as it’s at the right height. That doesn’t necessarily mean you need to be at the same height as your pumpkins. Move around to find the best angle. Consider shooting from below to create a big, menacing pumpkin, or getting up close to crop out part of the pumpkin. As you line up your shot, be sure that, when you look through the camera, you don’t see any of the candle flames through the pumpkin holes. This will turn into point light sources in your final image (rather than an orange glow) and might throw off your camera’s metering—throwing the rest of your image into darkness. 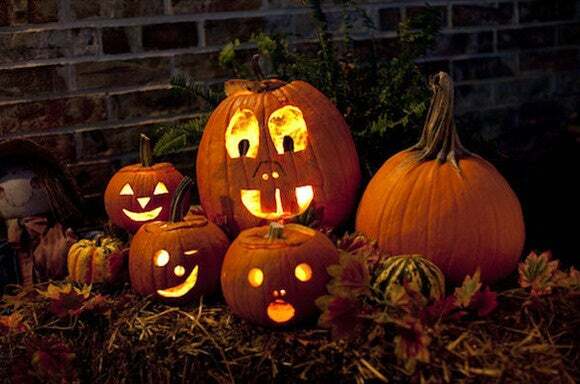 With a single light shining from one side, your pumpkin will be lighter on one side than the other. That should help emphasize the drama of the scene. But if you find that the unlit side is too dark, find a piece of white paper or cardboard, or a white sheet, and hold it up next to the dark side of the pumpkin to reflect light onto the pumpkin’s shadow side. Holding a piece of white cardboard next to the scene reflects light into the shadows. Light created by a white reflector is very subtle; so you may not be able to see what it’s doing at first. But it can make a big difference in your final shot. If your camera is positioned close enough to your pumpkins, you should be able to hold the reflector and trip the shutter without too much difficulty. Though it's subtle, here you can see the difference of shooting without the reflector (top), and shooting with the reflector (bottom). Using a digital camera? All cameras have a Program mode, which is a good place to start. In Program mode, your camera will choose a shutter speed and aperture for you. Again, shooting in low light requires longer shutter speeds. You can reduce these shutter speeds by selecting a higher ISO. (Every time you double your ISO, your shutter speed will be cut in half.) But keep in mind that as you increase ISO, your image will develop speckled patterns called noise. Some cameras produce more noise than others so you’ll need to experiment to find the best compromise. If your camera uses an Auto ISO mechanism that chooses an ISO for you, check to see what its upper limit is. Some Auto ISO mechanisms don’t go above a certain setting. So, for example, even if your camera can go to ISO 1600 (and shoot images without too much noise) the camera’s auto ISO may be programmed to not select an ISO above 400. If your camera works this way, you may want to override the Auto ISO setting. First, consider overall exposure: is the image too dark or too bright? If your image is too dark, increase your exposure. In Program mode, the easiest way to do this is to use the camera’s exposure compensation control. Check your manual for details on how to use yours. If the image is too bright, dial in some negative exposure compensation. You should also examine the highlights on the pumpkins edges. If the curves pick up too much light, they may overexpose and turn white. You might be tempted to fix overexposed highlights, by applying a bit of negative exposure compensation to make them darker, but then the rest of your scene will go darker as well. A better choice in this case is to move the pumpkin farther from the light. As you increase the distance to the light source, the highlights on the pumpkin will grow more diffuse. Note that in low light your camera will choose a very wide aperture, which will in turn create a shallow depth of field. This will throw your background out of focus, as well as possibly some parts of your pumpkin. If you’d prefer that the entire pumpkin be in focus—and if your camera offers an aperture priority mode—switch to that mode and choose an aperture with a higher number. Keep in mind that this will further slow your shutter speed, so you’ll need to balance how much depth of field you want with how long you’re willing to keep your shutter open. It’s easy to experiment and explore your scene. Try different compositions, try different lighting, add candles, or craft different backgrounds. Finally, note that all of these tips also apply to photographing people—or anything else—in low light.